When you read that a speaker manufacturer has been around since the mid-1940s you think it’s got heritage, a foundation and perhaps a proud legacy. I’m talking about Klipsch, a highly respected speaker manufacturer that has products ranging from home theatre systems to floor standing wooden cabinet systems, they even boast that their audio systems are found in one of every two new U.S movie theatres. 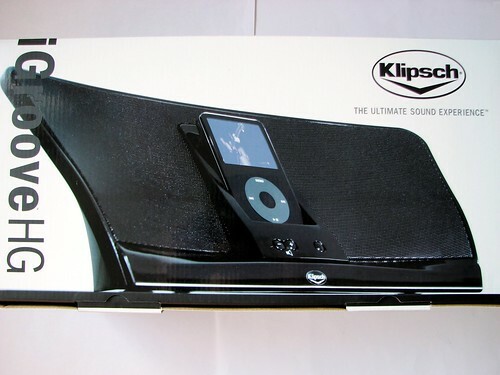 One speaker system in particular that draws my attention is the Klipschorn. Amazingly, this speaker system has been in production for the last 60 years and little has changed since its first model, making it the world’s only continuous production speaker. This just stands to prove the expertise and the seriousness that Klipsch has for audio technology. Mr Klipsch passed away in 2003 but his legacy still lives on and although I’m not writing about the Klipschorn today, what I do have here for you is another product from the Klipsch line, the iGroove HG. 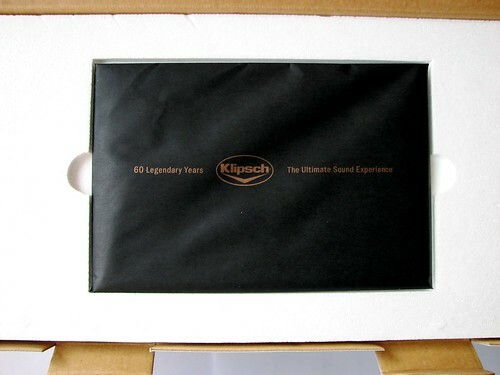 When you first open the box you are greeted with a nice black envelope that has the words written on it, “60 legendary years Klipsch The Ultimate Sound Experience”. Inside that envelope is a history of Klipsch and how it came about. Lift away this first section and you then get all the bits that you need to get this system running. 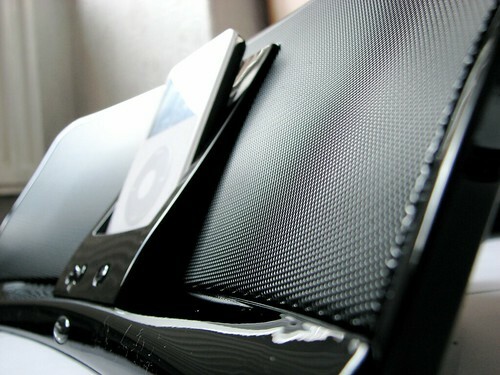 This includes the power adapter, the J-Cup dock (for all other mp3 players), Mini and Nano adaptors and a remote. Horn speakers are loudspeakers that are shaped like a trumpet horn and were originally found in theatres and concert halls. This helps to reproduce a wide range of frequencies equivalent to what a larger speaker system would output without the need for high-powered drivers and transformers. 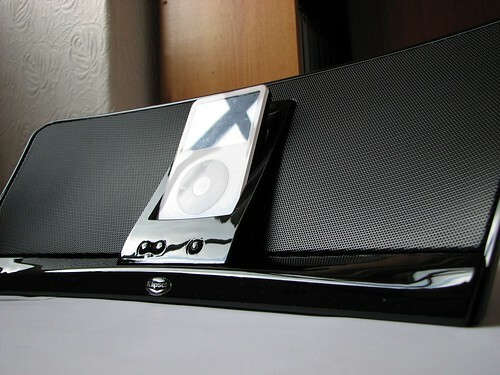 Klipsch have integrated these horn speaker systems, called MicroTractrix tweeters in to the iGroove HG making it the exclusive iPod speaker system with this type of technology integrated in to it. 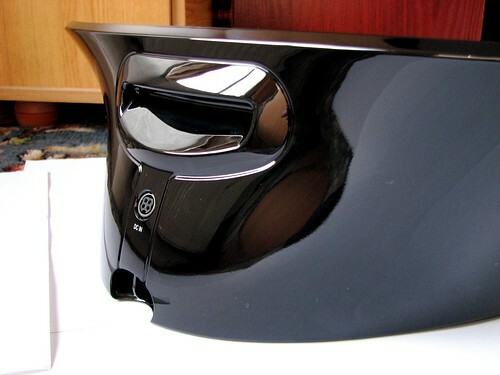 The curved shape of the iGroove HG is one that is both stylish and bold, featuring a glossy black shell and dock and an all-black speaker grille, you get the feeling that this is a ‘this means business’ speaker system. At the rear, all you will find is a handle and power port and on the front there’s just three buttons for the volume and standby. 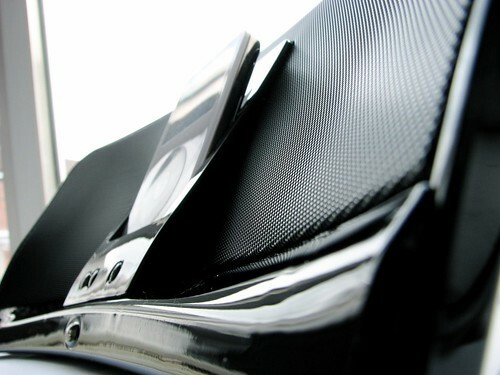 Unlike other black iPod docking speaker systems out there, using a contrasting white iPod with the iGroove HG didn’t deter from its ‘serious’ looks and it’s good to see that the small details haven’t been missed out. Rubber feet are fitted in to the bottom of the unit to ensure that any travelling vibration does not affect the sound quality. Whilst the overall design is quite bold with its curvaceous shape and glossy black finish, there’s not much to write home about in terms of LED disco lights. Sometimes it’s just best to keep the lights to a minimum and that’s the design route that Klipsch have gone for with a single LED for power status and even then it’s barely visible with two simple colours green for on and red for off. 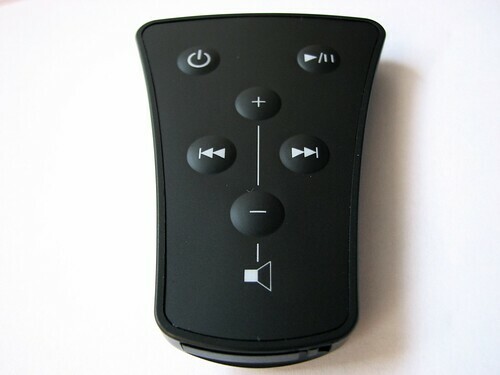 The remote that comes as part of the package is basic with the ability to play/pause, skip/rewind, power and volume up/down. It’s a tiny remote that has its design inspired by the same curvey looks as the speaker system, however the infra-red control system needs to be lined up quite accurately in order to for it to be recognised. I’ve spent the last four weeks listening to this speaker system just to make sure that I got a good mix and range of audio playing through them whether it be Pop, Voice, Rock or Alternative and I realised that I was impressed with the results despite a distinct lack of bass. For quiet listening I was able to put the volume down and still hear the track and the vocals and when I wanted to just blast some tunes, I was able to get a nice warm room filling sound that quenched my thirst for some banging tunes. What I missed was the ability to turn the bass up but since Klipsch are the audio experts who have ‘fine tuned’ this speaker system the best they know how, it’s quite understandable that they don’t want me to be adjusting equaliser settings, however other listeners out there may not be so forgiving. With Klipsch you’re guaranteed to get performance and at Â£180 it’s up there with some of the more expensive models including its main rival, the Bose Soundock but having listened to the rather unimpressive (and rather dated) Bose system, the Klipsch iGroove HG has definitely got one over them with crystal clear audio and a nice touch of bass in the right areas, bringing tracks to life with an upbeat momentum. I saw, I heard and I was impressed. Whilst this system doesn’t have the ability to adjust its equaliser settings such as Bass and Treble levels (having already been tweaked to perfection in the Klipsch labs) I would definitely recommend this to anyone who has a wide range of tastes in music that you will want to listen to at a party or some private podcast listening, the great thing about it is that it accommodates for both. Comparing this to the XtremeMac Tango that we recently reviewed, the Tango still holds a special place in my heart but there’s certainly room for the iGroove HG because you just can’t ignore all that obsessive engineering, design and testing that Klipsch put in to their systems. There’s not many systems out there that have been subjected to a custom-built anechoic chamber just to make sure that they definitely got it right.